Where Is The Muslim Aid To Haiti? There are 223 Muslims and 3 Jews for every one thousand people on this planet. With this great Multitude of Islam's finest, very, very few (2 or 3) have ever won a scientific Nobel Prize while Jews have won almost 200 [see my article Muslim Inventions - Nobel Prizes]. Similarly in the field of humanitarian relief, one finds an interesting lack of Muslim donor countries; blogger Freedom Fighter at Joshuapundit notes: "Nothing from the Saudis, nothing from the UAE, nothing from the rest of the Arab world, nothing from Pakistan or the Muslim nations in Central Asia, nothing from Iraq.. (1). Meanwhile Israel's efforts shine the brightest. Israel is the first country to establish a field hospital on the ground, see YouTube video. Here is a headline that Israel-hating CNN is most loath to display: "Not The U.S. But Israel Has The Most Sophisticated Hospital In Haiti" (2). A woman even gave birth at the Israeli hospital and named her child 'Israel' (3). Israel's field hospital is the most advanced, taking in patients that no one else can (4). When disaster strikes, Muslim countries seem to always be missing with humanitarian aid. In fact whenever help is needed, Israel is there. When black Sudanese refugees seek asylum from war they go to Israel for help [see my article 13 things to blame on the Jews]. When the Baha'is in Iran, the largest religious minority in that country, seek asylum from religious persecution they go to Israel for help [see my article Israel - The Safest Place in the world for Baha`is]. When the Palestinians were living under Jordanian Arab rule, there were no universities in the entire West Bank. Since the 1967 takeover by Israel, seven Universities have been commissioned there [see my article Arabs Live Better under Israeli Rule]. Non-Jews, blacks, Arabs, whenever someone needs help, they get it from Israel and the Jews. Even when Muslims need help - Muslim countries, especially the oil-rich Muslim countries are nowhere to be found. Want to know why? Because Muslims are busy spending their money, time and effort advancing Islam. Tens of thousands may die, but the building of mosques and Islamic centers must not stop. Billions for the Caliphate, but not one penny for the relief of human suffering. That is the difference between Muslims and infidels. Thanks to readers Roni, Bernard Wishnia, Jeff A and others for links to various stories. JoshuaPundit, Where Is The Muslim Aid To Haiti? But it's also interesting that as one looks at all the countries sending aid to Haiti, many Muslim countries seem to be conspicuously absent [(5)], in spite of all those petrodollars. Even Muslim Aid, the one Islamic charity that appears to be giving anything is based in the US. There have been pledges, which may or may not be honored - $1 million each from Kuwait and Morocco. There are some direct supplies from Iran, and contingents of aid workers from Indonesia and Turkey. Haitians who were overjoyed to see loved ones alive but injured after last week's quake are now having to watch them die slowly and painfully, doctors say. Infections are raging due to a lack of adequate medical supplies. but one hospital that was set up by the Israelis seem to be the most sophisticated as of today operating. woman who was eight months pregnant gave birth in the IDF field hospital in Haiti at 2:30 a.m., Sunday. The IDF reported that the infant, a boy, was named Israel. The woman was the first to give birth at the field hospital. 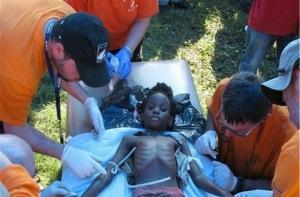 Footage from the IDF Field Hospital that has been set up in Port-au-Prince, Haiti, after the earthquake. This video includes footage of the first baby born at the field hospital on 17 January 2010. The mother arrived at the IDF field hospital 8 months pregnant and Maj. Dr. Shir Bar and Maj. Efrat Shayer delivered a healthy baby boy, who was named 'Israel' by his mother. The IDF field hospital is currently the largest operating in Port-au-Prince. It has a staff of over 40 doctors, with different specialists, nurses, paramedics and features a maternity ward, ICU, pediatrics unit, internal medicine department, a pharmacy, and operating rooms. The hospital can treat up to 500 patients a day. At a U.S. medical facility, doctors were asking why they didn't have critical equipment or the ability to perform surgeries, while a field hospital set up by Israel did. "The disaster was the quake. This is the disaster that's following in its wake," said Dr. Jennifer Furin of Harvard Medical School, referring to the lack of better medical care on the ground. Medical operations were under way off the coast on a U.S. ship for some patients who could be flown there. Families were "with their loved ones who they were so excited to see alive, only now to watch them die a slow, painful death from their rotting flesh because the infections are out of control and they need surgery," Furin said. "I've been here since Thursday. No one except the Israeli hospital has taken any of our patients," she told CNN's Elizabeth Cohen. Cohen visited the Israeli hospital and said it was "like another world," with imaging equipment and other machinery. "They have actual operating rooms, and it's just amazing." •The U.S. government is making an initial $100 million relief effort and is sending ships, helicopters, transport planes and 2,000 Marines. • Canada is sending $5 million Canadian (US$4.8 million) and matching contributions by individual Canadians to eligible charitable organizations up to a total of $50 million Canadian (US$47 million). Ottawa also is sending two navy ships, helicopters, transport planes and a disaster response team. • The World Bank is providing a $100 million grant, and the U.N. is sending $10 million. • Britain is sending $10 million. A four-person government assessment team and 71 rescue specialists along with search dogs and heavy equipment arrived Thursday. • Australia has pledged $9.3 million; Norway, about 30 million kroner ($5.3 million); Japan, up to $5 million; Italy, euro1 million ($1.46 million); and the European Commission, euro3 million ($4.37 million). • The Netherlands and the Italian bishops' conference have each donated euro2 million. Denmark has donated 10 million kroner ($1.9 million) and Finland is giving euro1.25 million ($1.8 million). South Korea has pledged aid worth $1 million. • Irish telecommunications company Digicel said it would donate $5 million and help repair the phone network. • Spain has pledged euro3 million ($4.37 million), and sent rescue teams and 100 tons of equipment. Germany gave euro1.5 million ($2.17 million) and sent an immediate response team. • India and China will each donate $1 million and China is sending a 60-member relief team with sniffer dogs. • Sweden has offered 6 million kronor ($850,000), along with tents, water purification equipment and medical aid. It is also sending a team to build a new base to replace the U.N.'s destroyed headquarters. • Venezuela has sent doctors, firefighters and rescue workers. Mexico will send doctors, search-and-rescue dogs and infrastructure experts. French President Nicolas Sarkozy said 400 staff from the public security authority are being sent, as well a ship with two surgical operating units, 50 beds for injured and earth-moving equipment. • Iceland and Portugal are each sending more than 30 rescue workers. Taiwan has sent 23 rescue workers and two tons of aid and equipment. • Israel plans to open a field hospital and is sending 220 rescue workers. • A Swiss rescue team is arriving overland from the Dominican Republic. A flight carrying 40-50 tons of aid goods is planned for Friday.